Former U.S. President, Jimmy Carter collapsed during a Habit For Humanity build in Winnipeg, Canada. The 92-year-old received medical attention for dehydration. A Habitat volunteer told CBC News he saw Carter, 92, collapse. Firefighters and paramedics were seen scrambling, and an ambulance was brought to the area. A spokesperson for Habitat for Humanity told media that Carter was taken to hospital as a precaution but has since told the organizers he is feeling fine. “He encourages everyone to stay hydrated and keep building,” the spokesperson said. 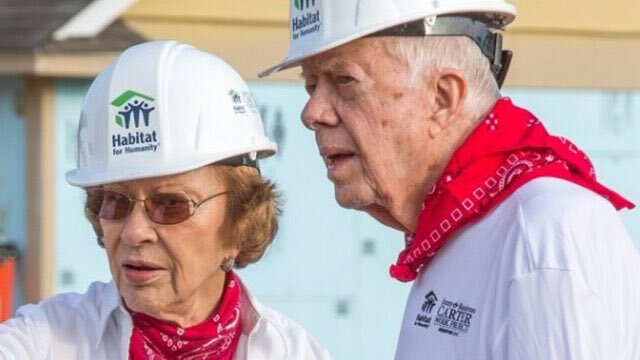 Carter and his wife, Rosalynn, are longtime supporters of Habitat for Humanity and are helping the not-for-profit organization with a build in the city. He’s 92, a former U.S. president and on Thursday, he’s in Winnipeg to help build a house for a family in need. Habit For Humanity CEO Johnathan Reckford briefs the press of the matter. The Gateway Pundit will update this developing story as details become available.